Imagine rows of vertical shafts of light that border a walkway, an entrance, or a progression of light sculptures winding through a plaza. Litetower is 6’5” in diameter and is 12’ high. The construction includes a translucent high impact acrylic DR out tube, with a 4" inner structural steel tube for secure mounting and housing all electrical components. 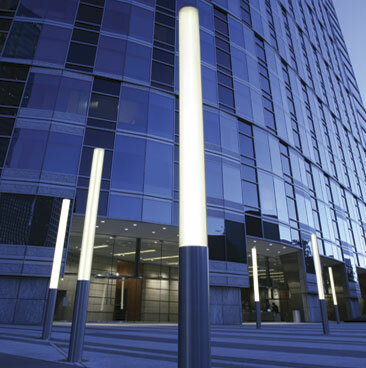 Litetowers is available with 1, 2 or 3 lamps. Lamps can be monochromatic or a combination of colors for a dramatic color-changing effect. Litetower is UL listed for dry and wet locations. Exciting materials such as brushed stainless steel cladding and stainless steel mesh can be wrapped around the acrylic tubing to create unique installations for every project.